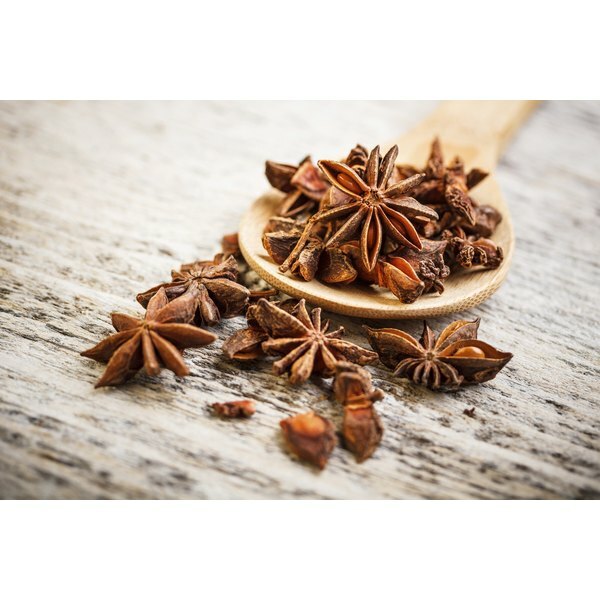 Originating in China, star anise gets its name from its star shape. This fruit has a licoricelike flavor and is used as a spice in many cooked dishes, where it lends a soft, exotic scent and taste to a meal. Star anise also has a history as a healing herb. Turn to Illicium verum, or Chinese star anise, if you're looking for a spice or healing herb. Don't use Japanese star anise, Illicium anisatum, because that plant is very toxic. In all cases, consult a medical professional before using star anise as a healing herb. According to the “Korean Journal of Medical Mycology," extracts from the star anise plant, Illicium verum, showed significant promise as a natural anti-fungal. When your body’s internal balance of bacteria and fungi is disturbed, a certain type of yeast -- Candida albicans -- can grow unchecked. If this happens, it can cause candidiasis, a serious complication. Candida albicans is found naturally in your intestinal tract, mouth and throat. Antioxidants are naturally existing compounds that protect your body’s cells from damage as a result of environmental toxins -- such as tobaccos fumes -- and free radicals, which are produced when your body breaks down food. Toxins and free radicals contribute to the aging process, as well as potentially placing you at greater risk for heart disease and cancer. In an animal study published in “Chemico-Biological Interactions” in 2007, scientists found that star anise reduced the amount of cancer development after exposure to carcinogens. The scientists concluded that the benefits of star anise for treating cancer was promising, but further study in humans is required. Shikimic acid is a plant-based material that is used to produce the anti-viral medication oseltamivir phosphate. According to an article in “Alternative Medicine Studies,” shikimic acid is found in high concentrations in star anise. The 2008 issue of “Journal of Medical Virology” found that shikimic acid, when combined with quercetin, another antioxidant-rich plant-derived substance, significantly improved immune function. Shikimic acid on its own, however, yielded little additional benefit. In a 2010 issue of “Journal of Medicinal Food,” scientists in Taiwan found that four anti-microbial derivatives from star anise showed great promise when they were tested against almost 70 strains of drug-resistant bacterias. The increase of drug-resistant bacterias -- ones that are not greatly affected by conventional antibiotics -- is troubling, and star anise may be effective in the future battle against these drug-resistant strains, although further study is required. Should You Use Lime for Wounds on Humans?